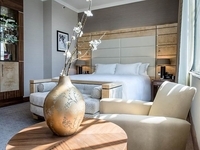 Hilton's £multi-million investment has restored the historic glory of the former Great Western Royal Hotel, one of London's most iconic Victorian buildings. Originally built in 1854, it was the world's first palatial railway terminus hotel and brought to life the vision of Isambard Kingdom Brunel, the great 19th century engineer whose designs revolutionized public transport and modern engineering. Situated at Paddington Station, it is one of the best-connected hotels in London. The location, just 15 minutes from Heathrow Airport on the Heathrow Express, makes it an excellent hub for UK and international travellers. Plus with four London Underground lines on its doorstep, guests can enjoy fast, easy access throughout the capital and beyond. Signalling a new era of premium business hospitality, the development combines British Victorian architecture with Art Deco interior design. The 56 new rooms of the GWR Tower offer spacious, elegantly appointed accommodation with separate areas for work and relaxation. GWR Tower guests can also enjoy first class service in the exclusive lounge at the top of the new wing. In addition, the hotel offers a comprehensive range of executive services including conference and meeting rooms along with a full range of hotel amenities, the Brasserie Restaurant, Steam Bar and a well-equipped gym.